Pure Chat is live chat and video chat support software. it was designed to help organizations have better conversations with their website visitors in the moments that matter most. it eliminated frustrating per operator costs and chat limits to ensure that your entire team can leverage the power of live chat without having to worry about skyrocketing costs as your team grows. Simply sign up for Pure Chat, grab the snippet of code to install on your website (or use one of our handy plugins), customize your chat widget, and start chatting. Pure Chat's free live chat plan gives users unlimited access to all of our core live chat features, which includes unlimited operators and unlimited chats. Pure Chat was designed to help organizations have better conversations with their website visitors in the moments that matter most. It eliminated frustrating per operator costs and chat limits to ensure that your entire team can leverage the power of live chat without having to worry about skyrocketing costs as your team grows. Simply sign up for Pure Chat, grab the snippet of code to install on your website (or use one of our handy plugins), customize your chat widget, and start chatting. Pure Chat's free live chat plan gives users unlimited access to all of our core live chat features, which includes unlimited operators and unlimited chats. Increase sales and customer happiness. We know you spend a ton of time and money getting people to your site. Make the most out of each visit by engaging leads and actively addressing questions and/or concerns. Why make your website visitors search for ways to get in touch with your business? We thought it was silly too, so we developed the Engagement Hub. You get to choose what contact options you show to your users and we’ll make sure they’re on every page of your website. 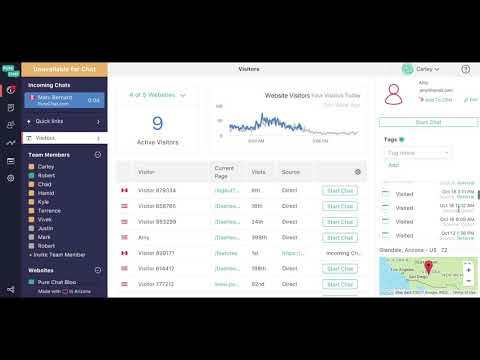 The dashboard gives you and your team the ability to look at traffic patterns, identify promising leads and be there to engage your website visitors at the right moment. No CRM? No problem! We have you covered. With Pure Chat, every visitor who has provided you with their contact information is saved so you can quickly search your leads and engage with them in a more meaningful way. We do everything we can to rollout new, innovative features and updates so that our customers continue to love Pure Chat as much as we do. Use Pure Chat with some of the most popular website builders and connect to popular apps easily.